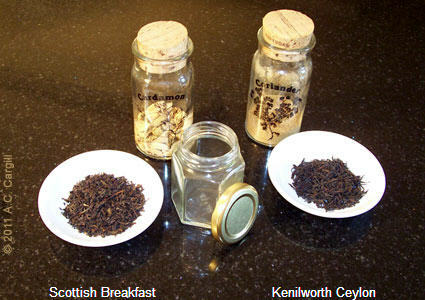 You see tea blends all over the place (for purposes of this article, I will include those “blends” that include non-tea substances). There are ones with marigold petals and ones with peppermint. There are some with dried pieces of apples and berries. Some have spices added such as cinnamon, black pepper, and cardamom. There are also blends that are all tea, mixing the right balance of a rich black tea from Sri Lanka with a milder black tea from Kenya or Nilgiri. But it’s pretty easy to create some of your own custom blends (believe it or not, in spite of the wide array of choices, you may not find a blend that suits you – sort of like shopping for shoes, neckties, hats, etc.). Your base will be a single tea, a blend of teas, or even herbals such as Rooibos and chamomile. And just like when you want to select the main color of your palette before painting a room, you want to select the basic tone of your blend. A green tea sets a different tone (often grassy, a bit bitter, and possibly flowery or nutty) than a black tea does (richer, astringent, malty, raisiny, etc. ), and herbals are a whole different experience. This applies even if you are blending several teas together and not including any non-tea items. Blend the right teas together. Or blend in the proper flavorings. Part of being “proper” means being top quality. Part means being good flavor pairings. You can blend a milder flavored black tea with a stronger flavored one, a green tea having a more grassy taste with one that is more nutty, and some even say you can blend together different styles of tea (green with black or oolong). I find it’s good to let the blend sit a day or two. You might even want to shake the container once or twice during that time to make sure the flavorings affect things evenly. Of course, you can also do some ad hoc blending. We do this at home all the time. We’ll cut open some bags of Typhoo, for example, and dump the contents in a small bowl and then add a teaspoon of another tea, stirring them together and them pouring into the teapot. We find that English Breakfast Blend No. 1 is a great flavor enhancer, adding its bold bright taste to the Typhoo. Black tea with any of these: true cinnamon from Sri Lanka, cardamom seeds (crack their shell open slightly), freshly crushed black peppercorns, vanilla (slice the bean pod lengthwise and scrape out the seeds into the blend), cocoa (or even cacao), rose petals, dried berries. Green tea (other than matcha) with any of these: citrus in either dried peel form or zest (grated fresh peel), lemongrass (gives that citrusy quality in a milder form and imparts a full mouthfeel – very pleasant), mint (preferably in the form of fresh leaves that you slightly crush), ginger (preferably in the form of fresh gratings off of ginger root), fennel seeds and licorice (don’t overdo unless you are a real ouzo fan), and jasmine petals (this is one item, though, that is better in the versions you buy ready made since the process of scenting the tea with the jasmine imparts a floral flavor that is more infused into the tea leaves than when you just throw some in with them at home). Rooibos, an herbal, is good with any of these: cocoa (a personal favorite pairing), ginger root, peppermint (in oil form), coconut (shredded), saffron, and rose petals. Tea Blend with Orange and Cinnamon: start with a top quality black Ceylon tea (about 4 ounces), add some diced orange peel (well dried) to suit your taste, and add in a half ounce of ground cinnamon, mix together, put into a storage jar, and let sit a day or two. Steep as you would any black tea. Blend with Rose Hips and Lemon: put some crushed dried rosehips (that bulbous shape that forms after the bloom has died and the petals have all dropped – if you have roses at home, you can gather these after the bushes have finished blooming, or else you can get them at a store selling fresh herbs) and some dried lemon peel into a container, shake a bit to blend, and let it sit for a day or two. Infuse in boiling water for about 8 minutes. Full of vitamin C. You could have some as a nice non-alcoholic hot toddy. Classic Masala Chai (Spiced Tea) Blend: the idea here is to start with a strong black tea (typically a lower quality tea in CTC form) so it will still taste like tea with the spices and milk added in, then add in various spices (typically cinnamon, black pepper, cloves, cardamom, cumin seeds, allspice, and nutmeg – each is best if you use the whole ones slightly crushed). Let the mix sit in its container a day or two, shaking it once or twice. Steep in boiling water in a saucepan for about 5 minutes, then add milk to the pan and let it simmer, strain into cups. I like that you provided some tips for blending your own tea such as selecting the proper flavors to blend. It is important that you perfectly blend tea flavors that match together. You may want to ask your friends for their own suggestions and see if you could experiment with different types of flavorings. If I were to blend my own custom tea, I would make sure to keep this in mind. Thanks.